Oshane Edwards and Kamron Greenidge Killed In A Car Crash In West Palm Beach | Schuler, Halvorson, Weisser, Zoeller & Overbeck P.A. 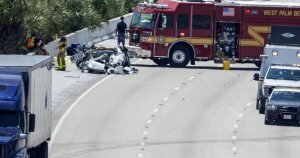 Two people were killed in a car crash when their vehicle spun out of control and crashed into a garbage truck along North Jog Road, West Palm Beach Florida Highway Patrol officials said. Florida Highway Patrol officials identified the crash victims as driver Oshane Edwards and his passenger Kamron Greenidge, both 22-years old. The truck driver, identified as a 36-year old man, sustain minor injuries and was rushed to Delray Medical Center for treatment. According to Florida Highway Patrol officials, the crash happened along the 3600 block of North Jog Road, north of Okeechobee Boulevard and west of Florida’s Turnpike. The preliminary investigation showed that a 2003 Nissan, driven by Edwards, was traveling north on Jog Road at a high rate of speed when Edwards lost control, entered into a spin and crashed into the truck . Edwards and Greenidge died at the scene. Florida Highway Patrol officials disclosed that it is still investigating the crash to see if alcohol or drugs were a factor.